This page here will share minor tidbits, tricks, cheats and hints about Wild Arms. As with many of the other guides on my website these are designed to be very google friendly. If you're stuck, and googling to to get done a certain part of the game, that's hopefully how you found this guide! Inside of the Guardian Shrine you'll find two different puzzles that require you to light torches in a specific order. The first puzzle you come across is shown in the screen shot on the left, each of the four torches you need to light are marked with a number and color coded. The second set of torches that you need to set ablaze in this dungeon come in an H pattern and are shown in the screen shot to the right. Click on either of these screen shots to enlarge them if you're having trouble seeing them. The only way that you can view the world map is if you first acquire the Magic Map item which is found at the very end of the Mountain Pass dungeon. The southern entrance of the Mountain Pass, shown in my screen shot above; has a crumbled rock wall which you can blow up with a bomb just above the two guards, also shown in the screen shot above. Inside this small room is where you will find the Magic Map, which will let you view the world map. 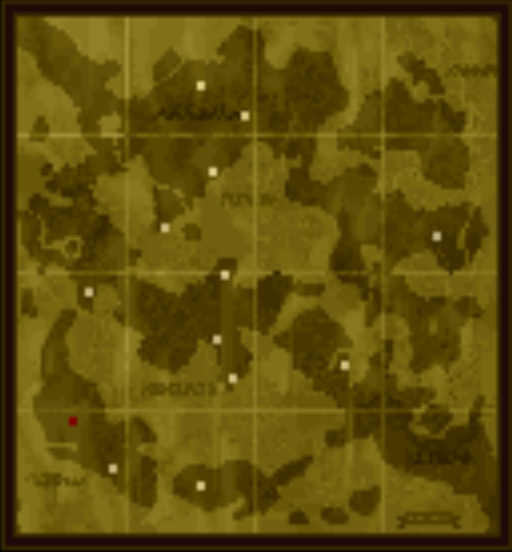 One of the items you need to collect in order to finish the game is the Ocarina which allows you to summon the Earth Golem to your current location (assuming you're on land). 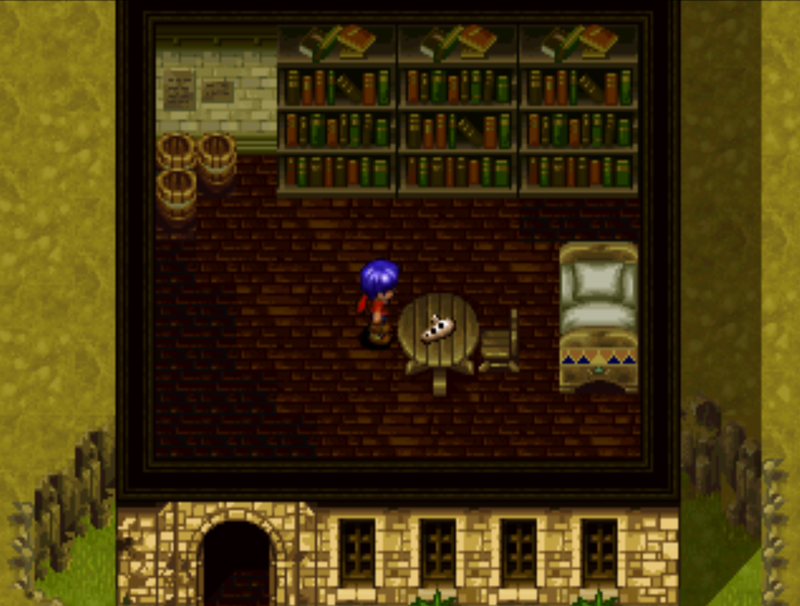 This item is found sitting atop a table in a building which is on the eastern end of Filgaia. Use my map above for better directions, click to enlarge it if you need to. Gemini's Corpse is one of the first dungeons that you need to visit after you obtain the Protowing and can fly around the world map. In the screen shot above, I am standing just outside of Gemini's Corpse on the world map. If you're having trouble finding the dungeon use that map. The Ancient Arena is one of the first locations that you come across after entering the Outer Sea. When you first come across it, it'll likely be too tough for you to tackle at that time but you can come back later and compete in all four rounds to win some nice prizes. Once you obtain the Black Pass item from Gemini's Corpse you'll be able to access the Black Market in Adelhyde. 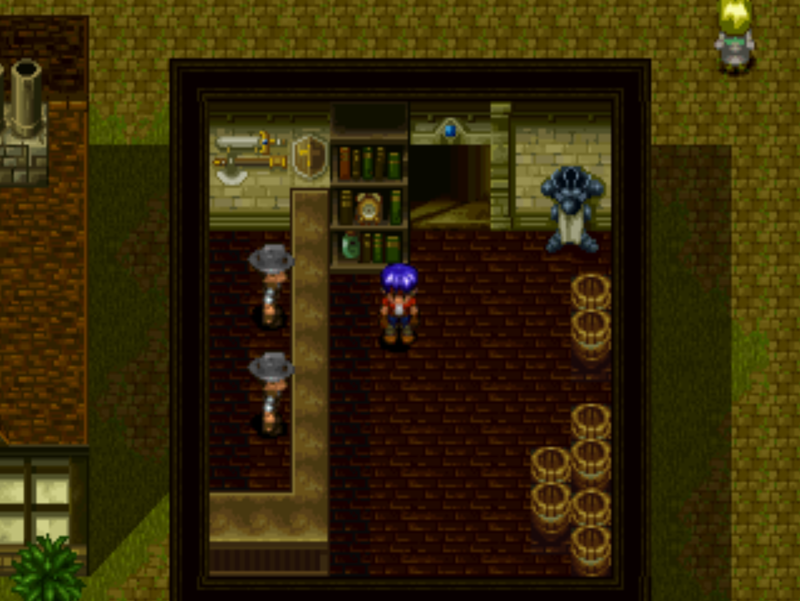 In the regular Item/Weapon shop of Adelhyde stand next to the bookshelf and use the Black Pass item from your inventory. It'll cause the bookshelf to move aside and allow you to go down to the Black Market. 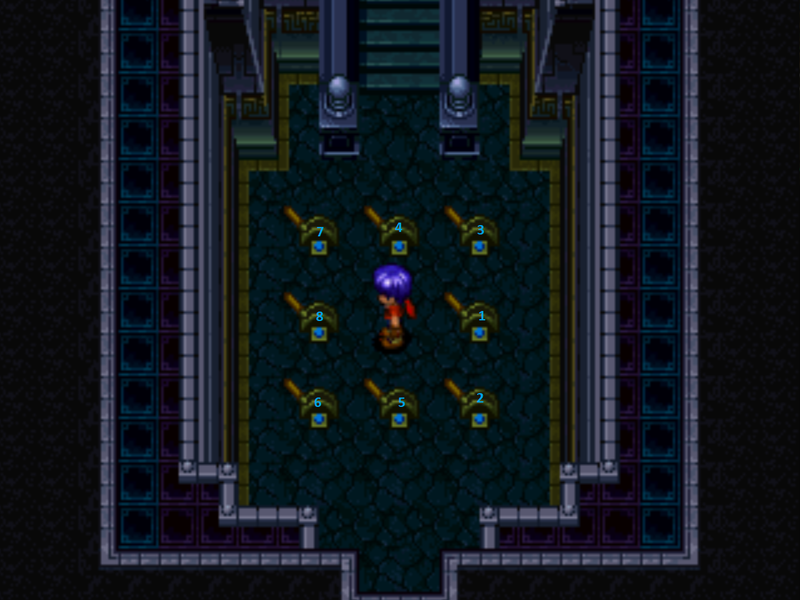 Towards the end of the Ka Dingel dungeon you'll come across a room with 8 different levers. Using one of them will cause the others around it to change as well. Click on the screen shot above to enlarge it, each of the levers are numbered with the order you'll want to use to complete the puzzle. The hardest dungeon in Wild Arms, which contains the hardest boss (even harder than the end boss) is The Abyss. 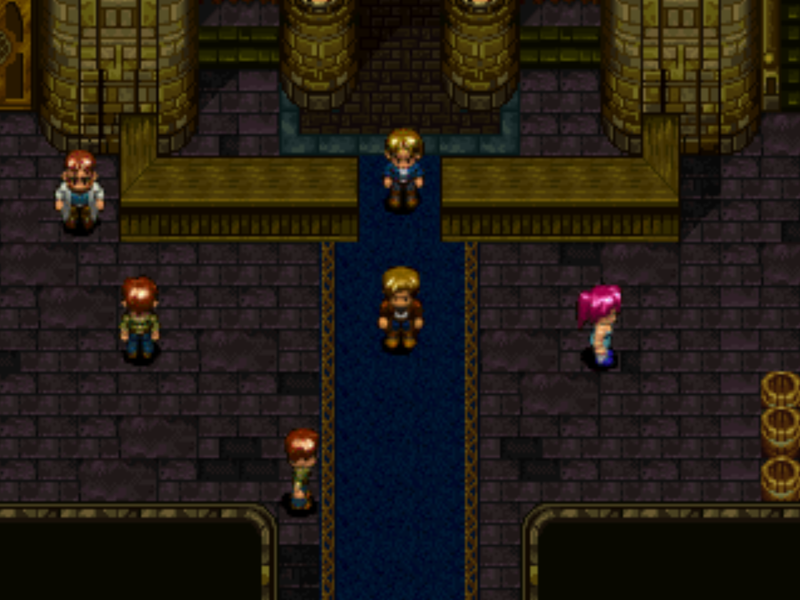 Before coming to this dungeon you should have two tools, Rudy's Power Glove and Jack's Guitar. To reach this dungeon you'll need to pound the ground of an Elw Pyramid and then jump on the teleporter as the screen is shaking. North of Baskar Village there's an odd ring of stones that you pass by earlier in the game but are unable to do anything with. 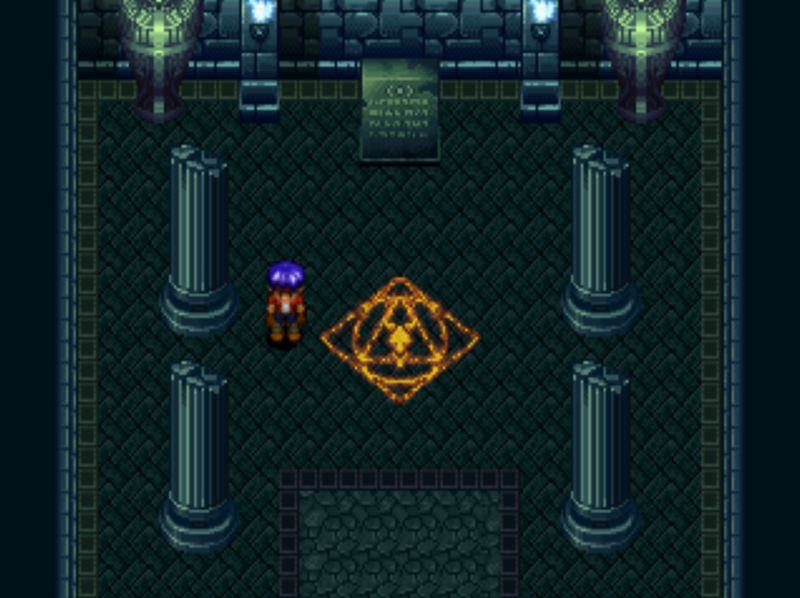 It isn't until much later in the game, after you finish the reconstruction of Adelhyde and obtain the Dispellado that you're finaly able to gain access to Illusion Temple, which is in the center of these stones. 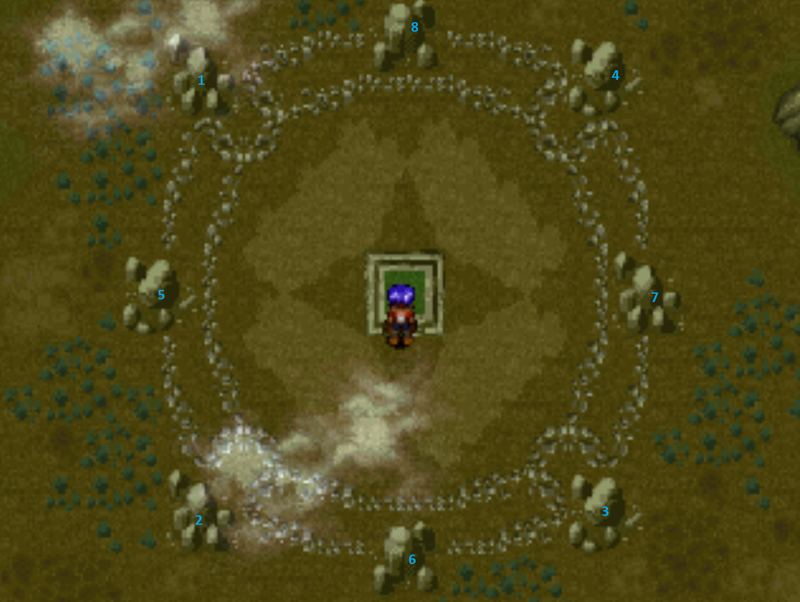 Cecilia's Ultimate Force Ability is called Dual Cast and it's obtained by completing the Heaven Corridor dungeon which is just north of Curan Abbey, where Cecilia begins the game. It will require you to obtain the Protowing before you're able to reach this dungeon. There are many different Optional Bosses in Wild Arms, some of them you meet throughout the game in certain dungeons and others are always available at the end of the game & hold the best equipment you can get. This guide will go over almost all of these optional bosses, the strategy for defeating them and where they're found. As always, there's a 'best' location to level up at in these types of games. This guide will talk about the two best locations for EXP, depending on what level you are will determine the best location for you. One of these locations also has enemies which drop Duplicators, rare items which are required for some dungeons.